Videos are a key part in any destination marketing campaign today. For our own part, we’re more about substance than style as you’ll soon see, but with any luck, you’ll have enjoyed our idiosyncratic methods anyway. Picture montage, like our Inishowen video above. Commentary, like our The Norman Way videos. Humourous, of the tongue in cheek Irish variety. As part of any package, we’ll devise a video that suits your budget. If you seek something a bit more ‘polished’, that can be arranged too. However, we’re keen to convey a down-to-earth sense of a place and for that, a free-flowing and knowledgeable presentation beats fancy graphics any day. We like nothing more than showing off a great landscape on a good day. In this video, we’re showcasing stunning Malin Head and a notion we hope some other coastal community might adopt – a natural amphitheatre for showing local talent from storytelling to drama, singsongs to workshops. Ensure you showcase at the right time of year – for Rindoon peninsula that means when the bluebells are in abundance in May. Richard Collins is just the sort of person we love to interview; knowledgeable, camera comfortable and to the point. Do you have local neighbours who have what it takes for a one take shoot? Getting the main man/woman of a local attraction to give an overview of their business allows the viewer to see what they can expect on a visit to that attraction. Pat Doherty from Doagh Famine Village is another great raconteur who deftly combines the micro with the macro in the course of his talk. If you’re doing more than offering a bed and making a breakfast, shout that special feature from the rooftops. Welcoming a fleet of classic car enthusiasts to a unique eco lodge then bringing them into a heritage village, playing trad music for them and driving them home safely fits that bill – tell the world about it. Though the phrase is slightly hackneyed at this stage, we like nothing more than telling the world about a place that they might well walk past if they are not in the know. Fr. Barney’s grave in Glenties is one such place combining the social history of a place with its connections to a theatrical masterpiece. Combining a stunning collection of images from our friends at Vanishing Ireland and adding in some original music used in our audio guides is a simple idea that works. Why not gather up your locality’s ‘characters’ and elders and add in a tune of the area to it? Combine motion film with photographs to convey the full wonder of your locality and let a song sell the rest of the story. 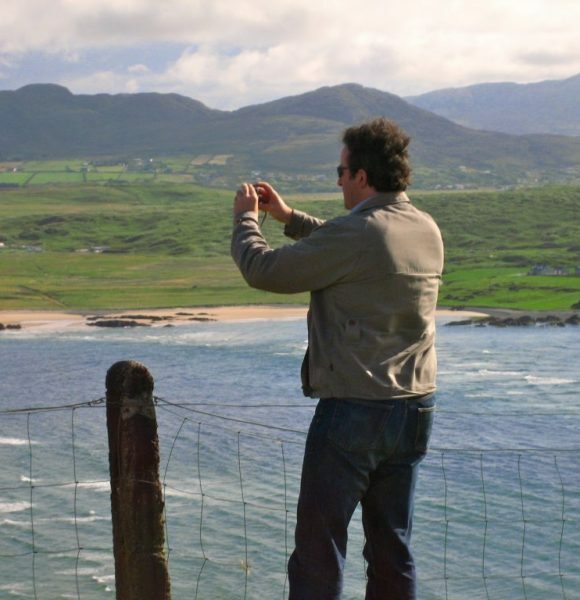 Here’s how we marketed our Wild Atlantic Way tour for Donegal a while back. Those waves just had to be seen in their full wildness we reckon. Won a big award? Make a tasty brown bread? Got a lovely walk/river on your doorstep? You need to be marketing these desirable features if you’re in the hospitality trade. This simple montage of a national award-winning B&B (sadly no more!) with the hosts’ words worked well in whetting the appetite of the would-be visitor. With some sounds effects, colourful narration and good photography, a place’s past can quickly come to life – Youghal is one such town where a whole lot has happened and this video helps to convey that rich past. Good storytelling on the part of the hosts helped bring the sights, sounds and even smells of medieval Youghal to life here. Getting Star Wars on your backyard created a chance to make a cheeky video about our own Donegal App which was available back then (2015). With some artistic licence, why not come up with an off the wall idea that might just become the next big viral sensation? Consider the when of launching your video. Our native travel app, the Donegal App was made available on the 29th of February 2012 and so we ran with the whole Leap Day motif. With some help from Beethoven’s 1812 overture, we think we’ve created a video that certainly leaps out, as it were! The week after Donegal won the 2012 All Ireland Gaelic football final was the week when Guinness were having their infamous Arthur’s Day ‘celebrations’. We parodied a famous Guinness surfing ad and superimposed the hero of the hour, the team manager Jim McGuinness and the end result is a fitting tribute to the lads. And yes, that’s Jim et al at 5am or so at their homecoming party in the last shot! Getting a brainwave for an idea should be seized upon and recorded. Here’s that other famous Jimmy captured the night before that 2012 All Ireland. He kindly sent his congratulations to Jimmy McGuinness in advance of a victory. As always, the late great Jimmy Magee was a pure pro in one take. However, seeing as the big day had not arrived and as a way of not tempting fate, Jimmy Magee was good enough to also record a video to commiserate with the Donegal manager if they fell short the next day. Now that ladies and gentlemen, is a pro for you!